A striking map is from a rare Spanish translation of Botero’s geographical and political commentary. It is one of the few maps to be published in Spain during the sixteenth and early seventeenth centuries. 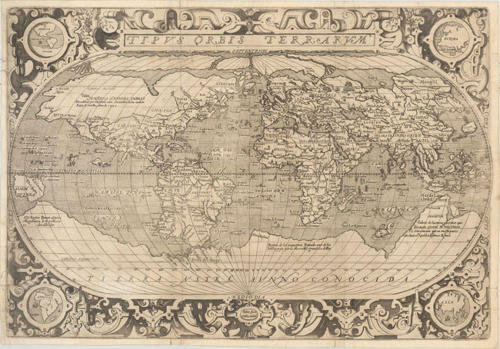 The map is based on the work of Abraham Ortelius. It depicts the earlier portrayal of the Americas, including the characteristic bulge in South America, but with the strapwork surround and medallion design of Ortelius' later maps. North America is elongated with an apparent Sea of Verazzano connecting to a convenient Northwest Passage below the Arctic, shown with the four rivers flowing from the North Pole derived from Mercator's map. The Atlantic is filled with fictitious islands, including Frislant, S. Brandan, Brasil, and Sept cices. The huge southern continent of Tierra Austra Aunno Conocida is dotted with names from the explorations of Marco Polo, including Beach, Lucach and Maletur. Tierra del Fuego is included in the southern continent, and New Guinea is shown as an oversized island off its coastline. In good condition, issued folding with very light soiling, minor extraneous creasing, and a few tiny holes along the folds. There are some short fold separations and 3 tears (ranging from 1.5" to 3" in length, and almost completely confined to the decorative border) that have all been closed on verso with old paper.